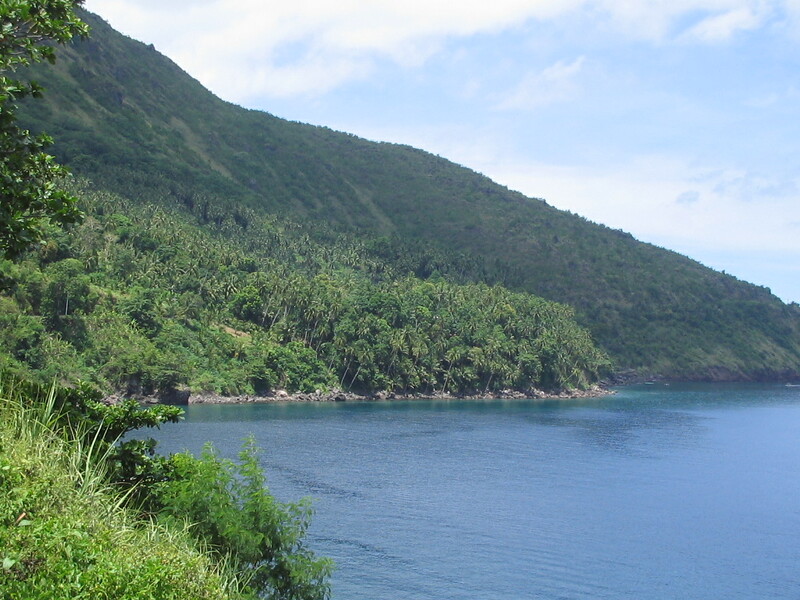 Camiguin is the second smallest province in the country, next to Batanes. 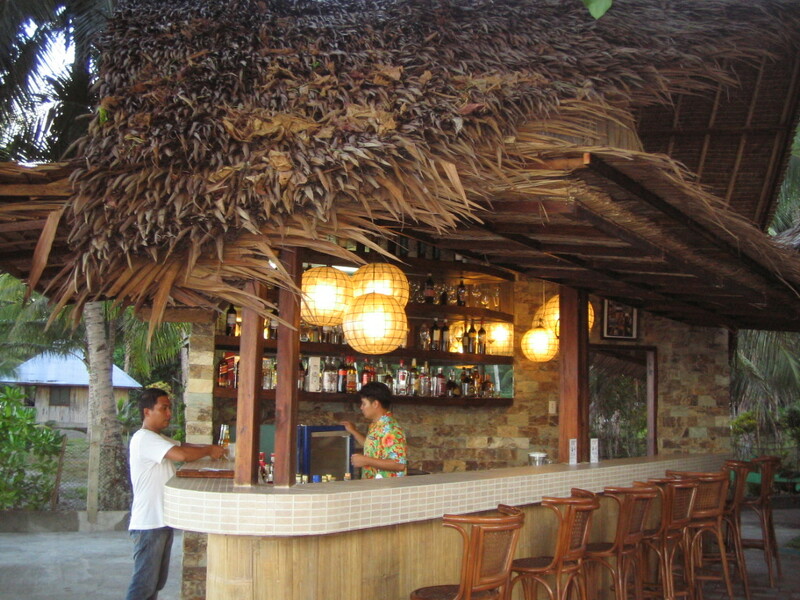 Its charm lies in its being an unexciting place for people looking for a wild night on the town. 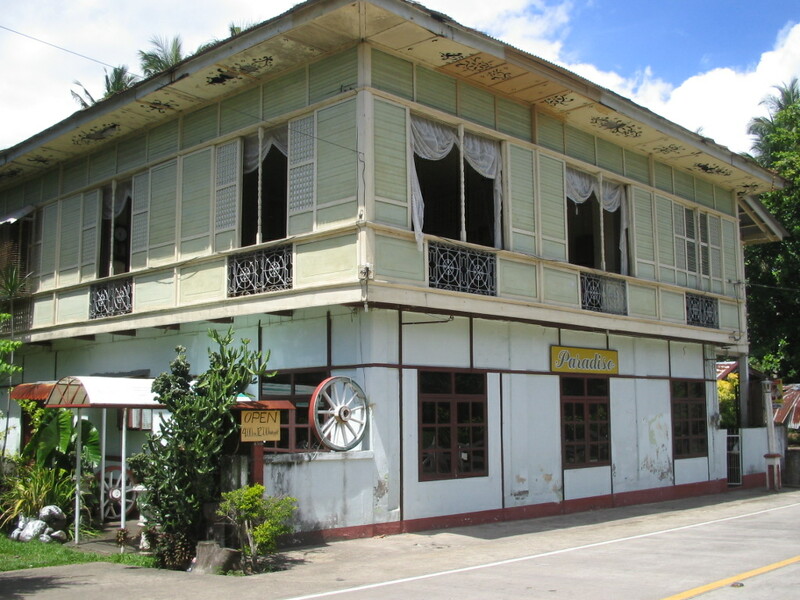 Even the capital town of Mambajao tends to sleep early at night, with just a videoke pub on Roof Top for those who would want to spend an evening outside of their resorts. 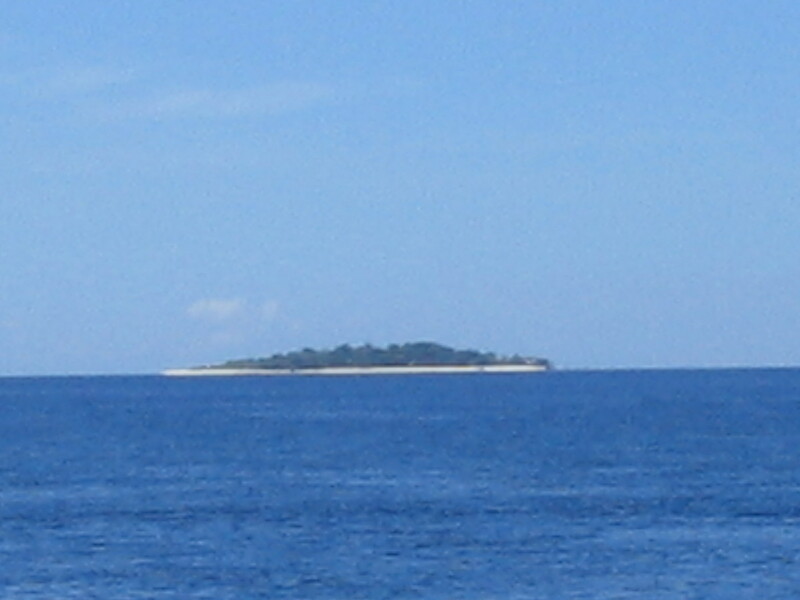 The island is a perfect eco-tourism destination. 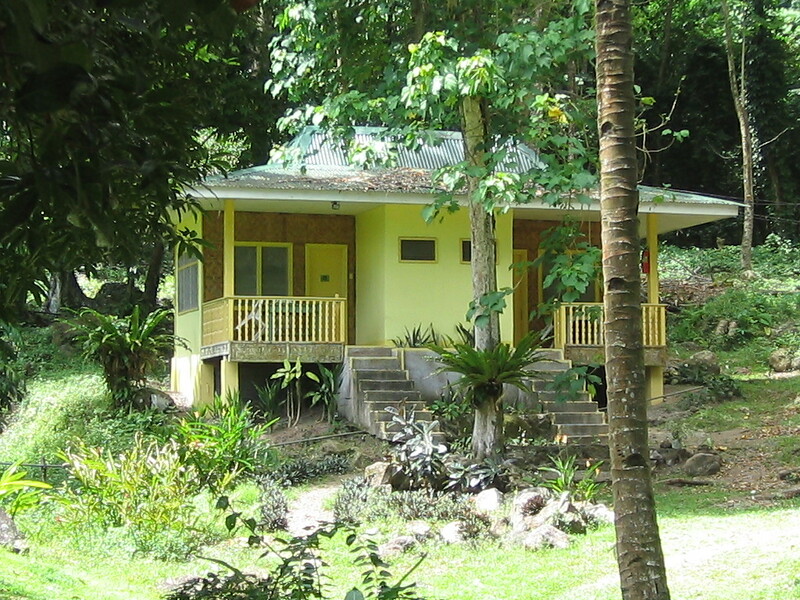 Beaches, nearby islands, volcanoes, hot and cold springs, waterfalls, and lots of hiking and trekking opportunities. 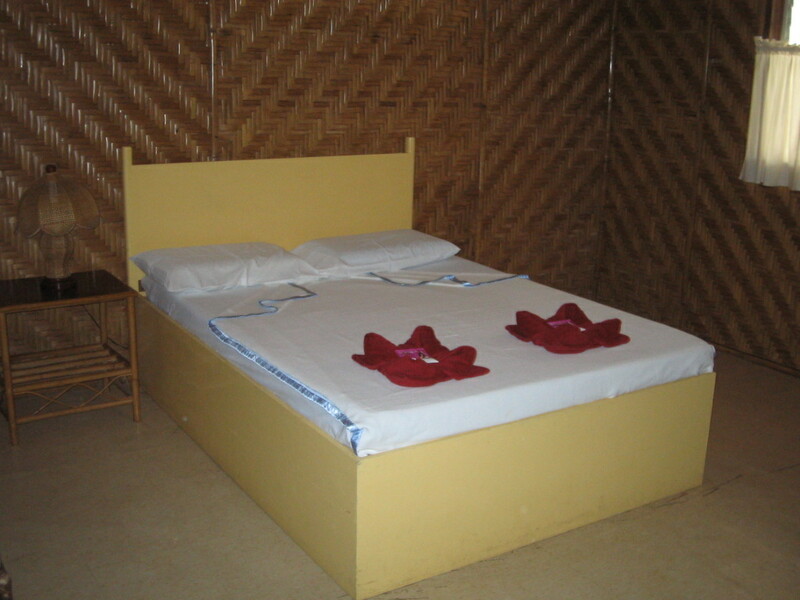 Accommodations are also varied. 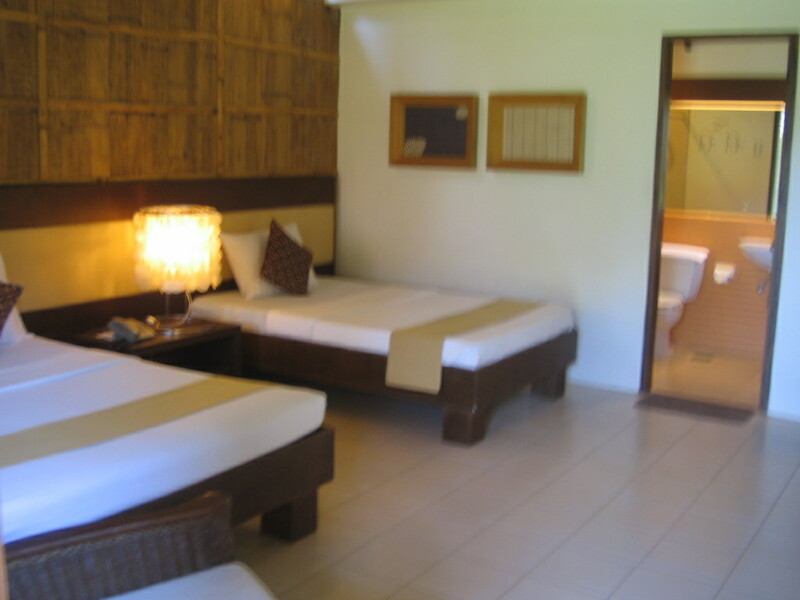 From high-end resorts offering amenities similar to Metro Manila hotels, to back packers’ hostels at P250 per night. 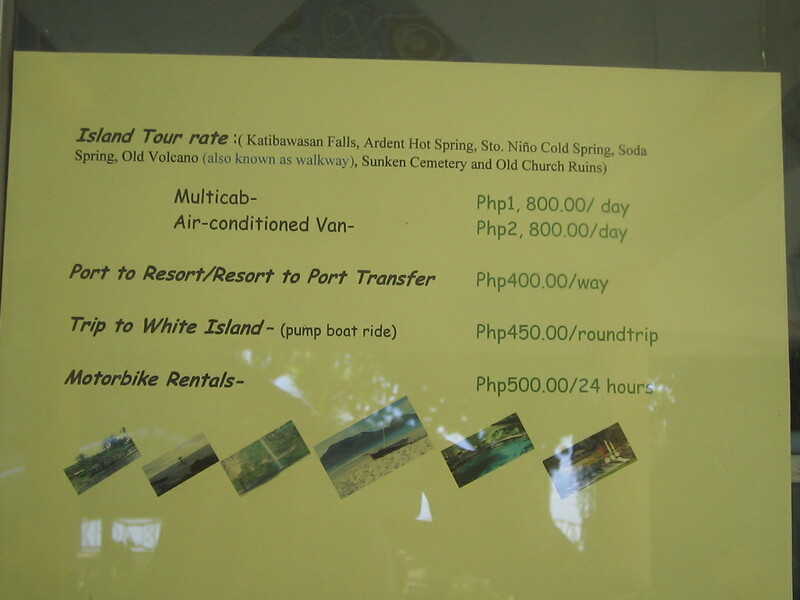 Island tours can be done in air-conditioned comfort by renting vans, or in the sturdy jeepney-like Multicabs, on motorbikes that can be rented for P500 for the whole day, on motorellas (like the tricycles of Metro Manila), on habal habal, or simply by walking. 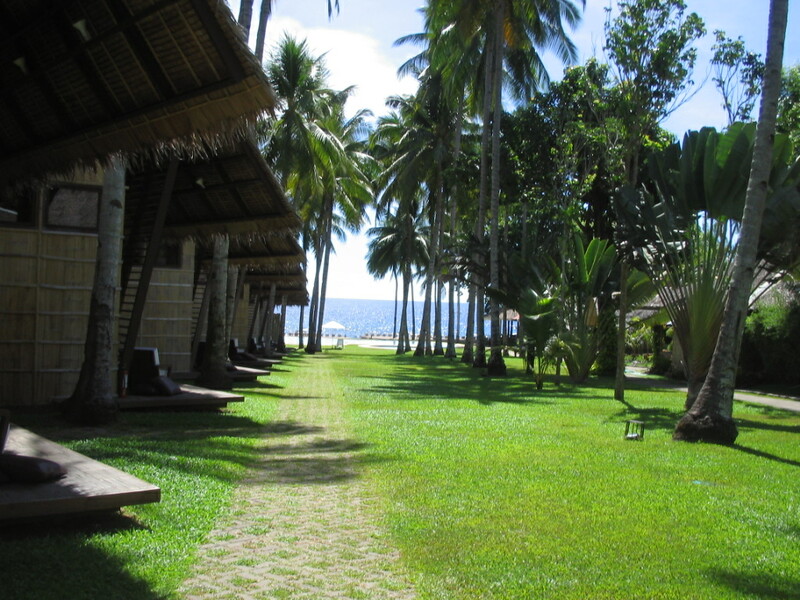 On a visit ages ago, I walked around the island, all 64 kilometers of the coastal road, spending the night in resorts in whatever town I am in by end of the day. Only to move out in the morning and continue walking – – on to the next town where I would spend another night. 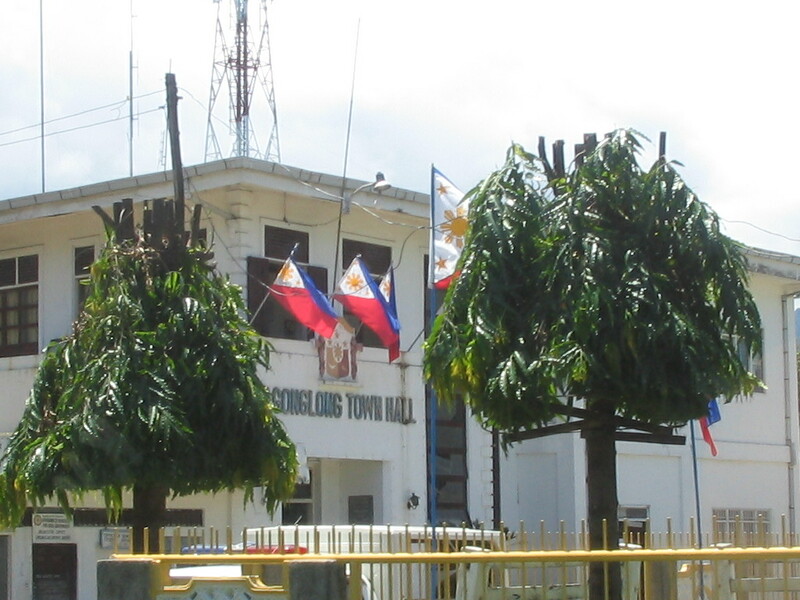 I spent two nights outside of Mambajao then, and was back in this capital town on the third day. 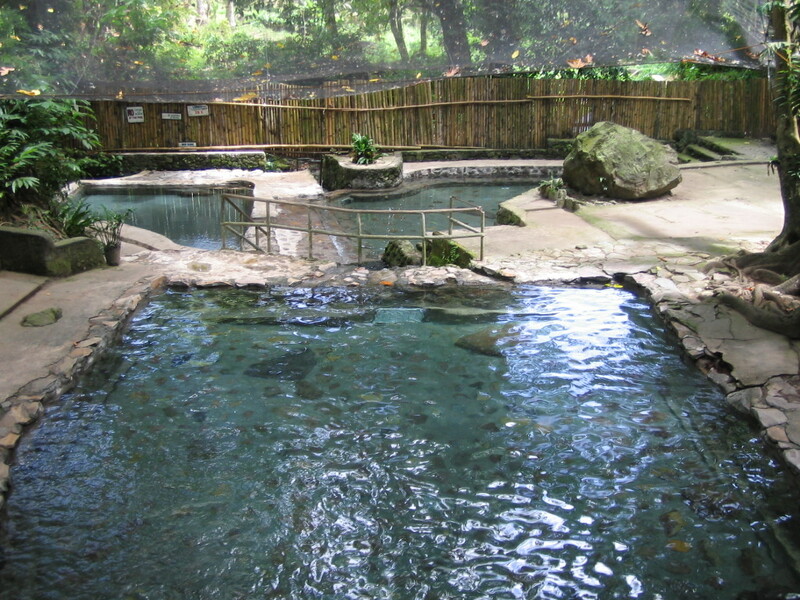 Ardent Hot Spring is at the foot of the Hibok Hibok volcano, some 3 kilometers from the main road. 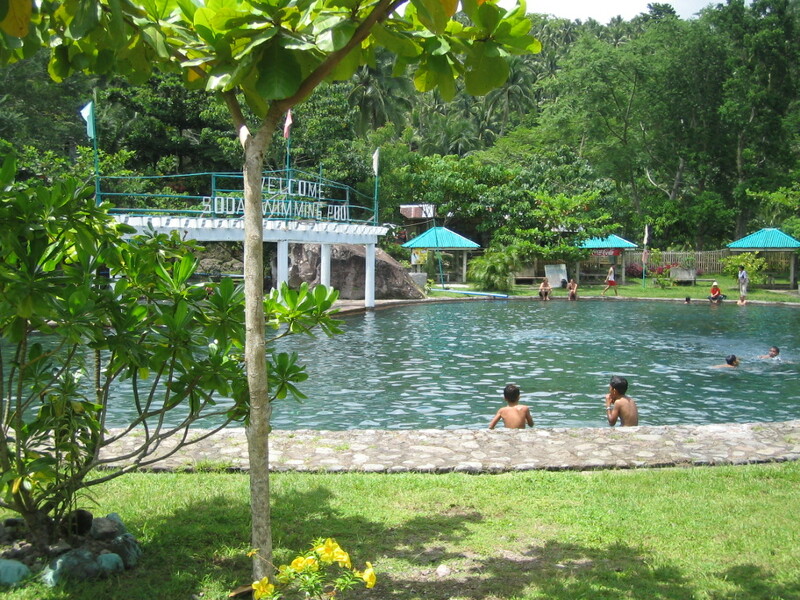 The water is normally at 40 Celsius, making it an ideal overnight swimming destination. 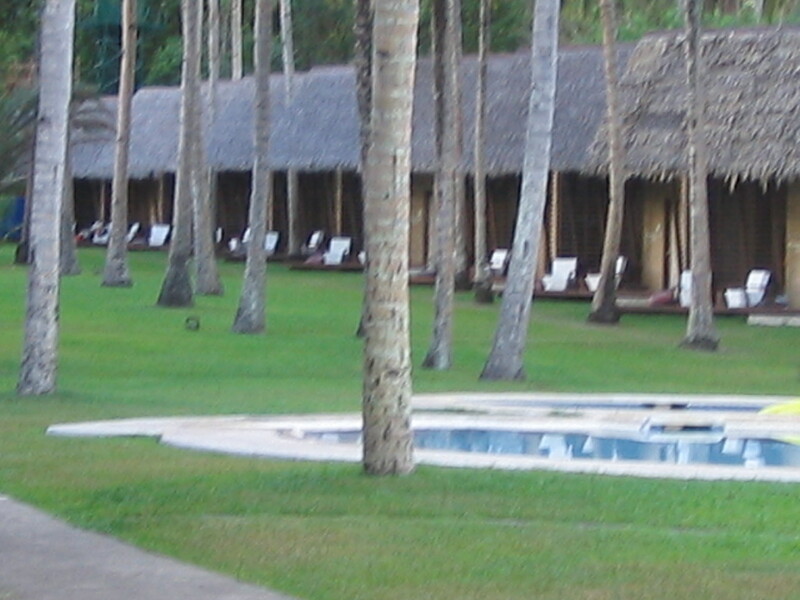 Accommodations are available within this resort. We passed by a very familiar old house, with the same sign “Paradiso” that I saw some 15 years ago. Apparently, the owner of the old restaurant has maintained the lease on the old house, but now does business nearby, using another business name – – Luna Ristorante Italiano. Old Vulcan was next, with the Way of the Cross as a stop. 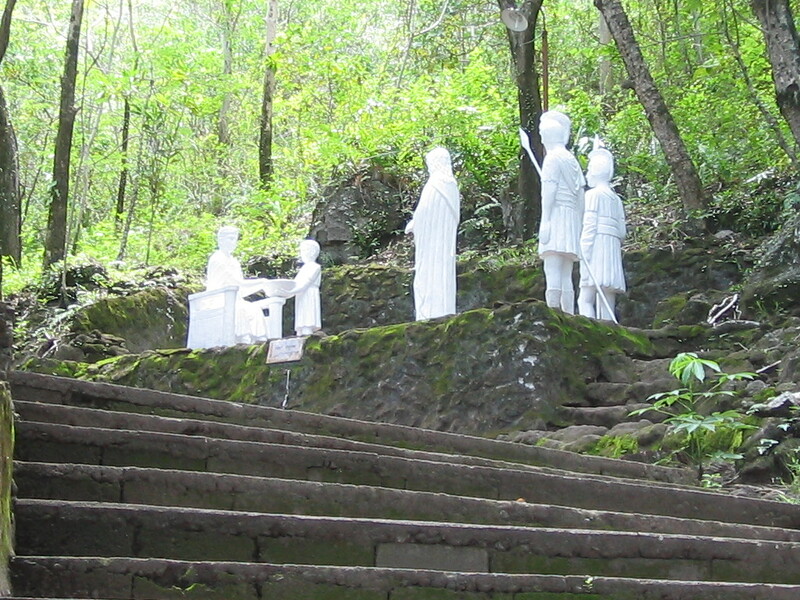 There are 300 steps to complete the Via Crucis, but I made do with the first 2 stations. 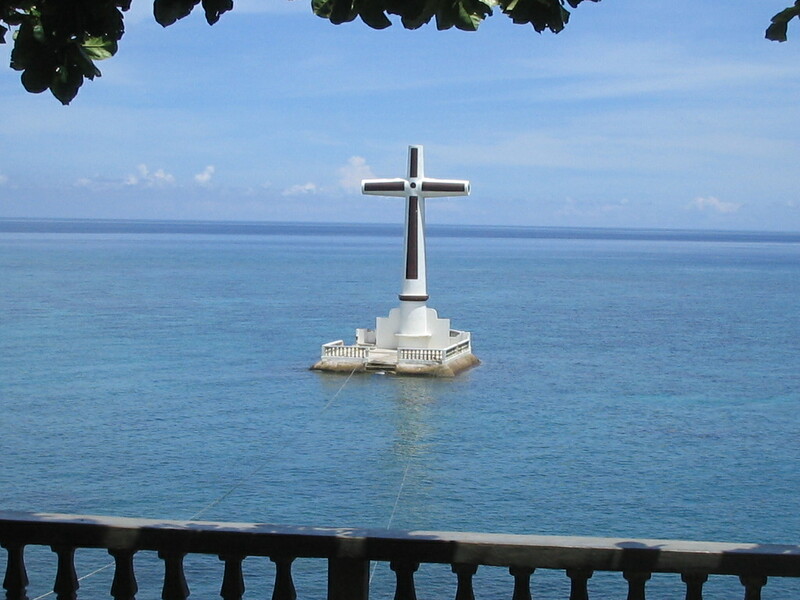 Immediately next is a fish sanctuary where a cemetery was sunk by a volcanic eruption, and where a cross now stands as a marker to define the area of the Sunken Cemetery. 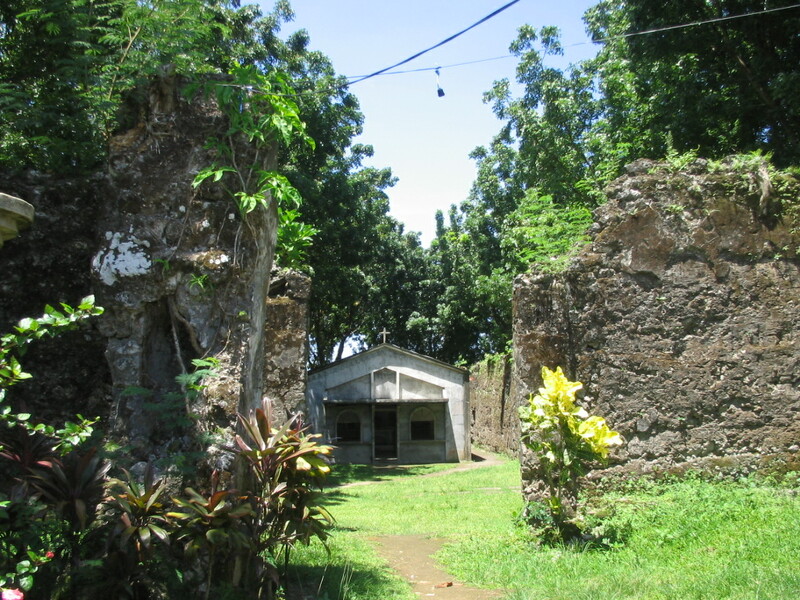 Nearby is the Guiob Church ruins, with a small chapel inside the ruins.I thought that the church or the government should have kept the character and feel of the ruined church, and should not have built that chapel inside the ruins. 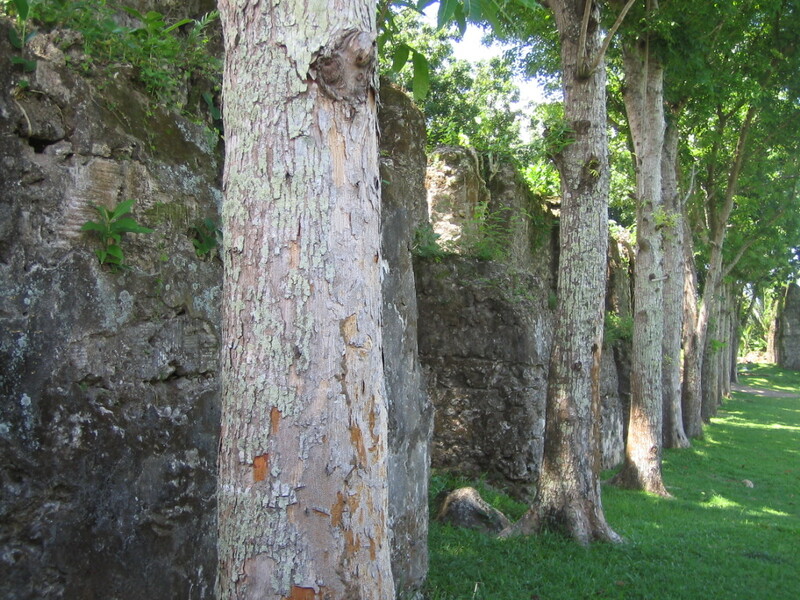 Maybe an altar using old stones would have been more appropriate. 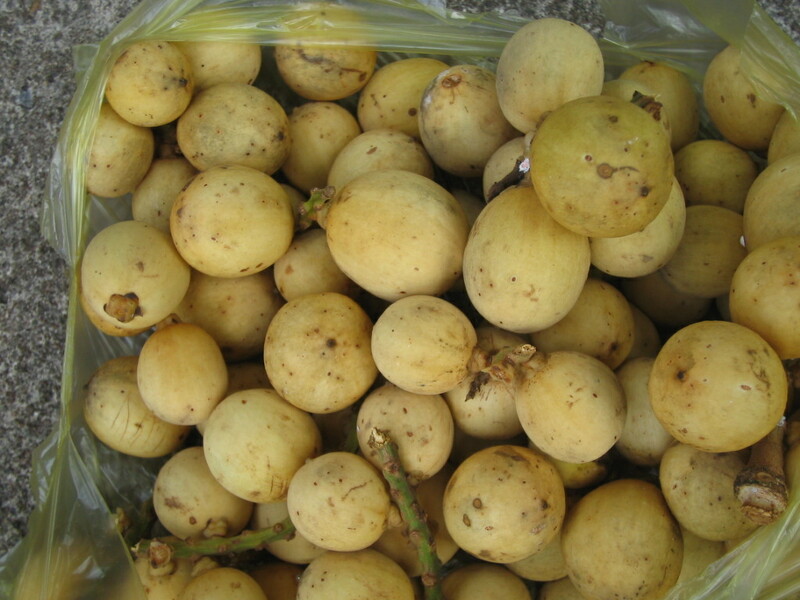 I bought a pack of lanzones for P90 from vendors near the ruins, not wanting to pass up the chance to savor Camiguin’s most famous produce. Next stop was the SODA Swimming Pool, that I will make sure I skip on a next tour, and advise friends not to waste time on. Nothing extraordinary here, and the pool is not even spectacular. 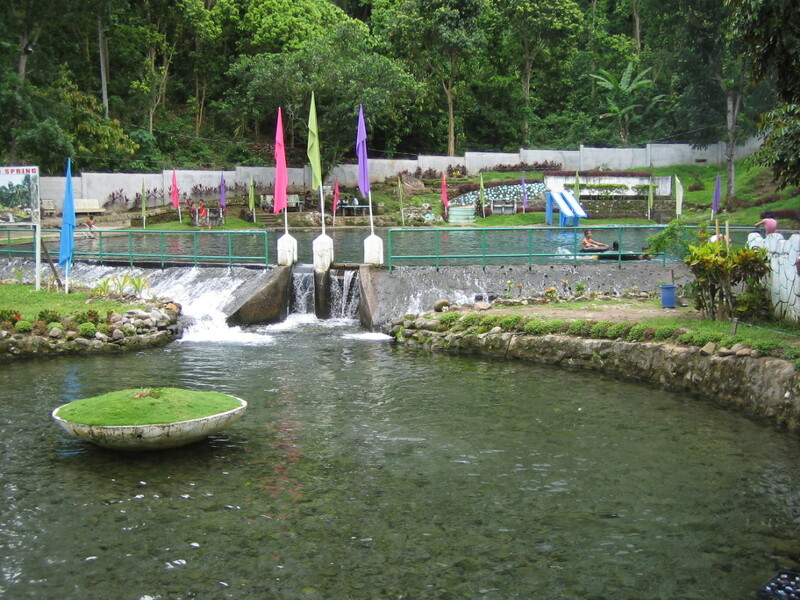 But Sto Nino Cold Springs is a stop I will recommend to friends. 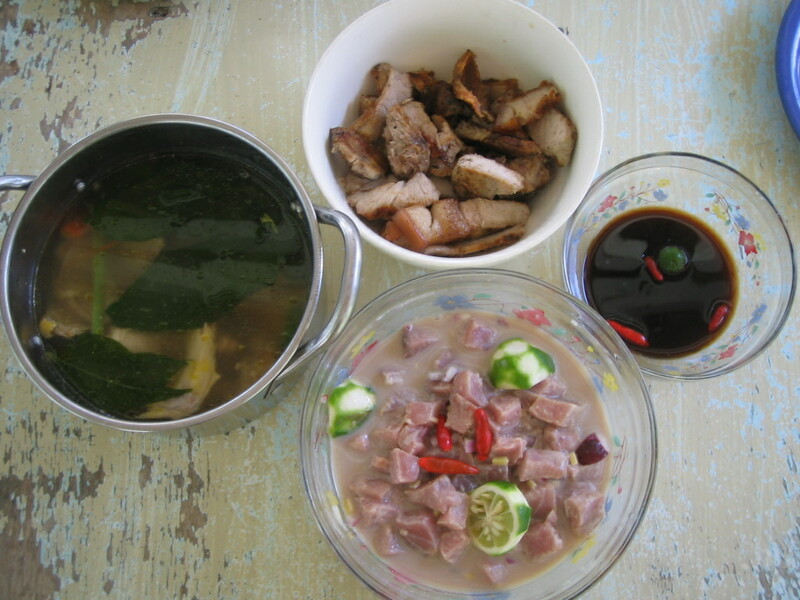 Not only is the water refreshing, the place has picnic sheds for P50 and there are women outside of the complex who would arrange to cook dishes for you – – – freshly cooked lunch (1/2 kilo kinilaw, 1/2 kilo tinola manok, 1/2 kilo inihaw na baboy, rice, and 3 pcs fresh buco was only P540, including the cooking and the utensils that they themselves will set up, and move out, of your picnic shed. 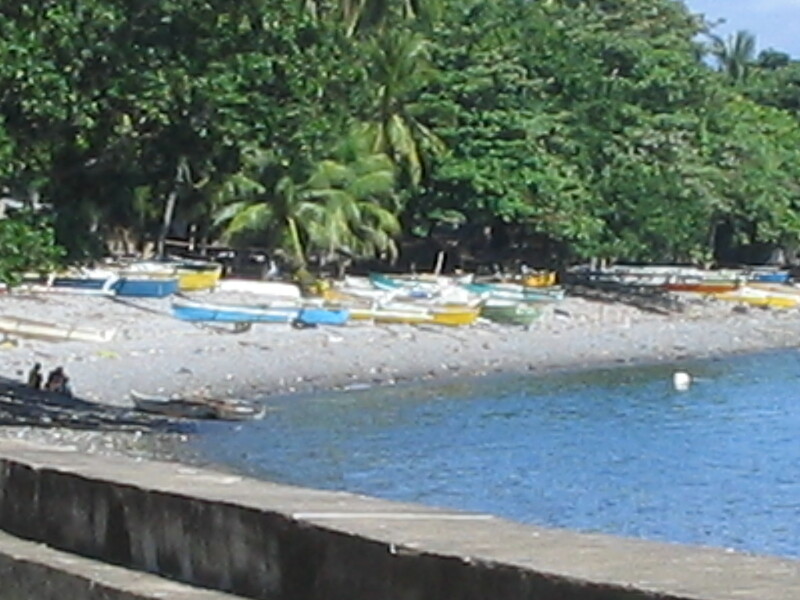 We also visited the town of Guinsiliban where I took a photo of a row of boats on the shore. 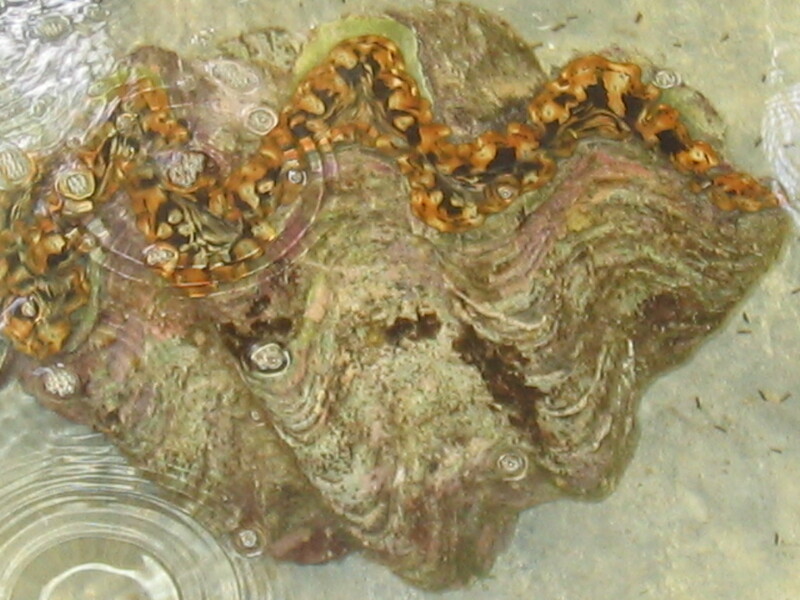 Part of Guinsiliban is Barangay Cantaan, home of the giant clams, with some measuring as long as 2 meters. 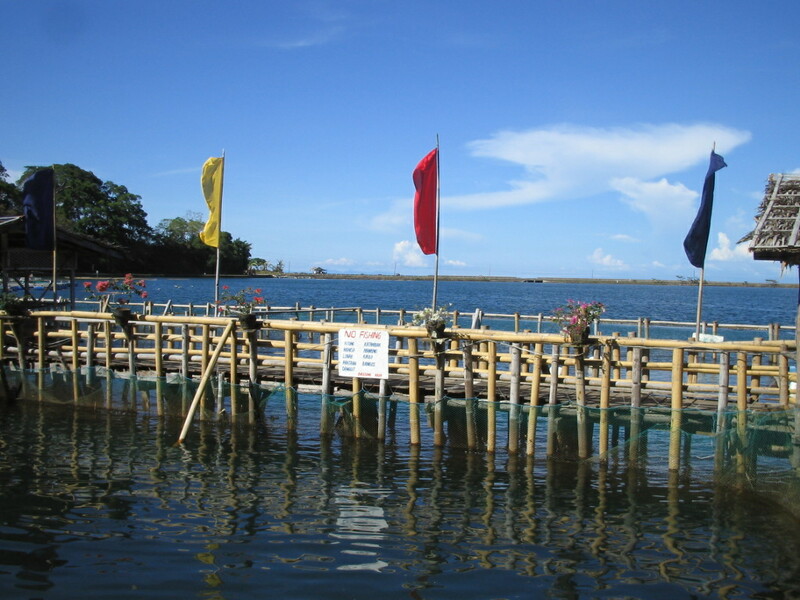 The clams can be viewed live on the water, with fees arranged thru the volunteers of this park. 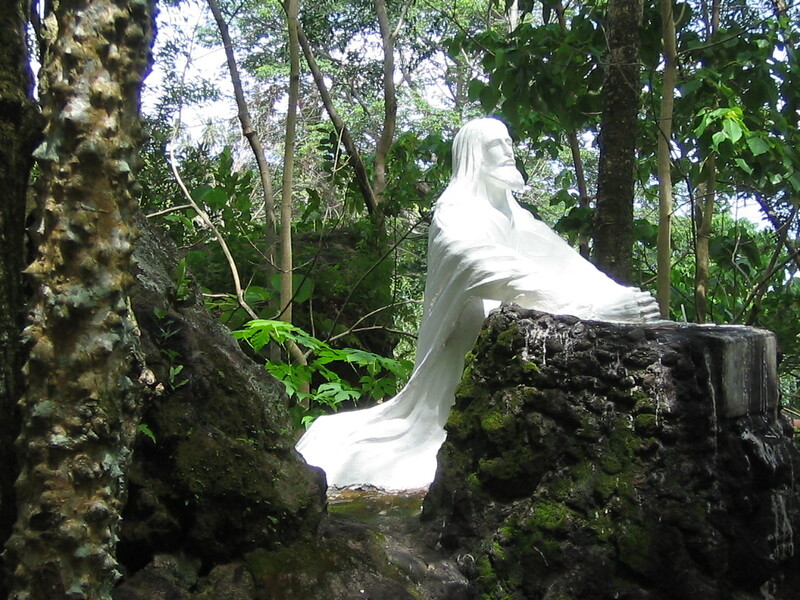 It was the feast of St John (San Juan) and it was a holiday in Camiguin. 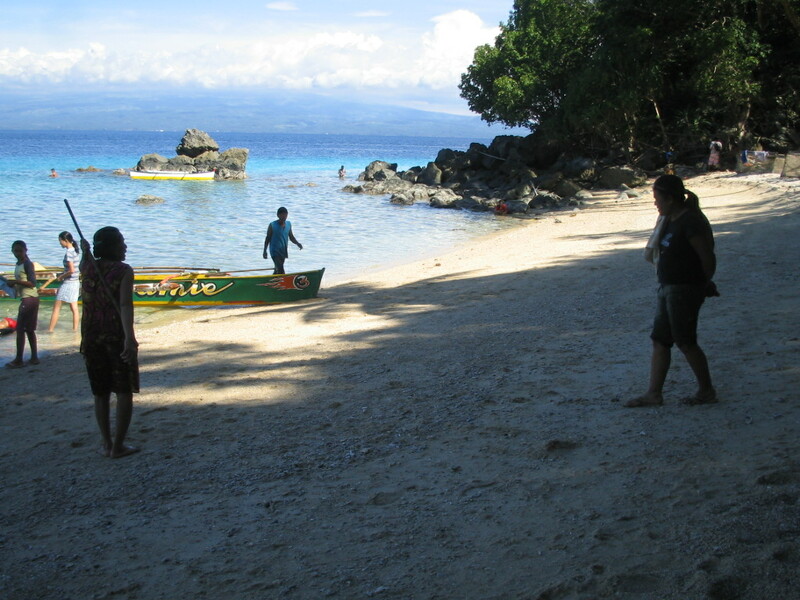 People went to the beach, including White Beach in Cantaan. 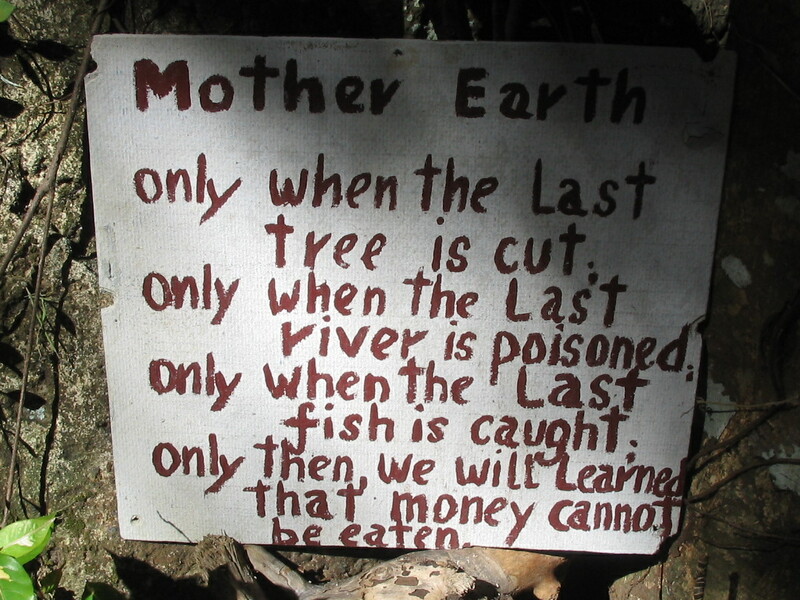 Somewhere near the beach, in a cluster of shrubs and a tree, I saw this sign that struck me for the way it expressed the truth and the inevitable consequence of being irresponsible with nature. Forget the grammar, but I urge everyone to keep this in their hearts. 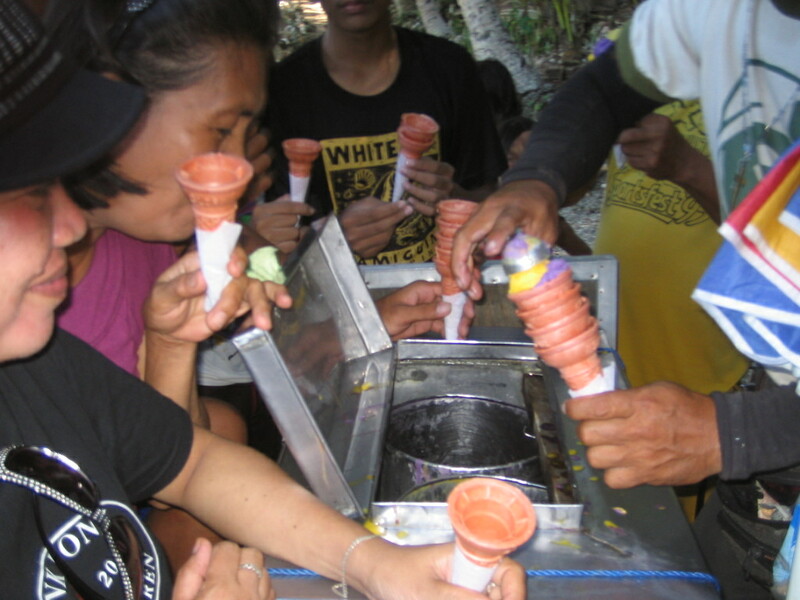 A big group was having a program, when a dirty ice cream vendor passed by. He was immediately surrounded by the entire beach population, and it took rather long before my turn to buy 3 scoops at P5 came. 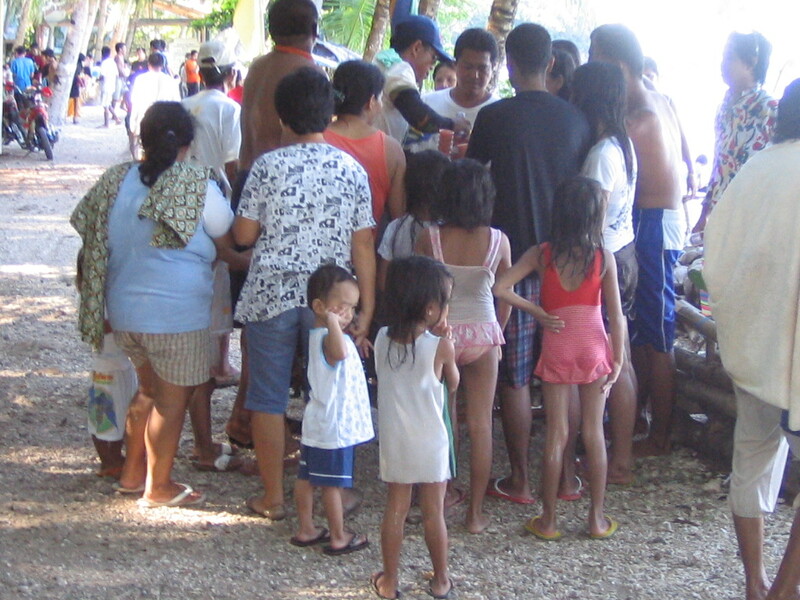 It was like a scene straight out of EDSA, with the vendor literally being mobbed. as if this was the last ever ice cream on earth ! 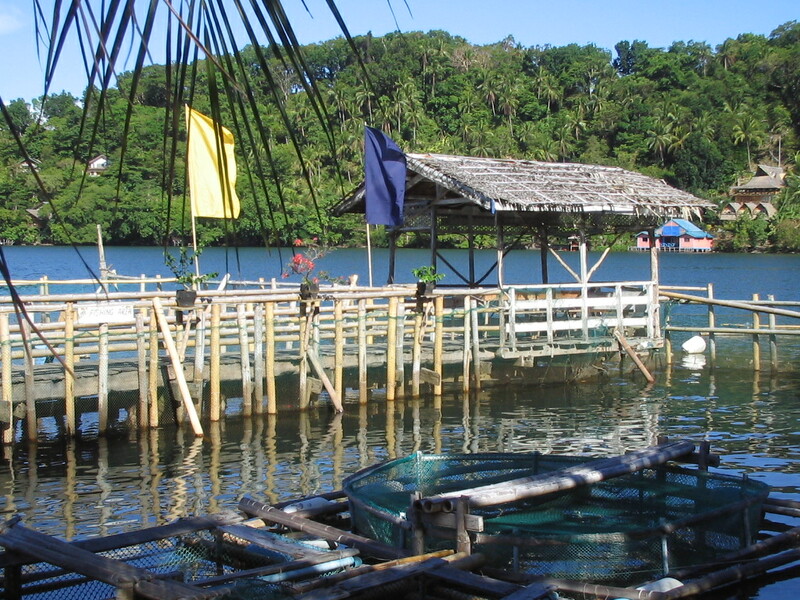 We then stopped for coffee at J&A Fishpen, a popular seafood restaurant. 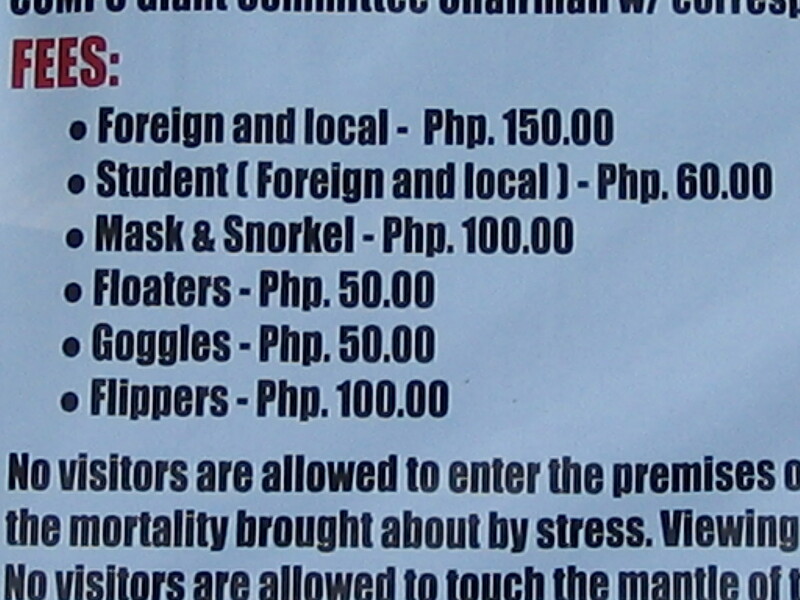 So popular they charge a P5 entrance fee to those who come just to take photos. I ordered coffee instead, so the entrance fee was waived. Enigmata is an artists’ haven. 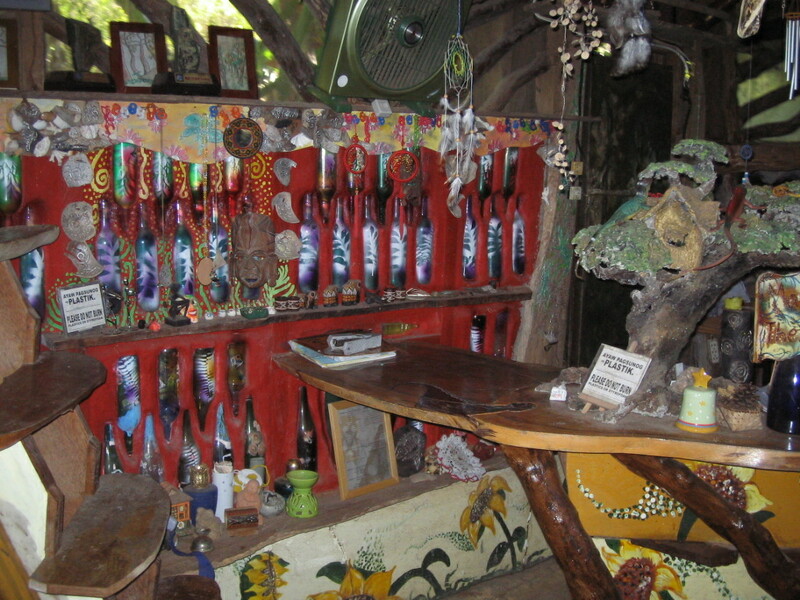 I liken it to Tam-awan Village in Baguio. 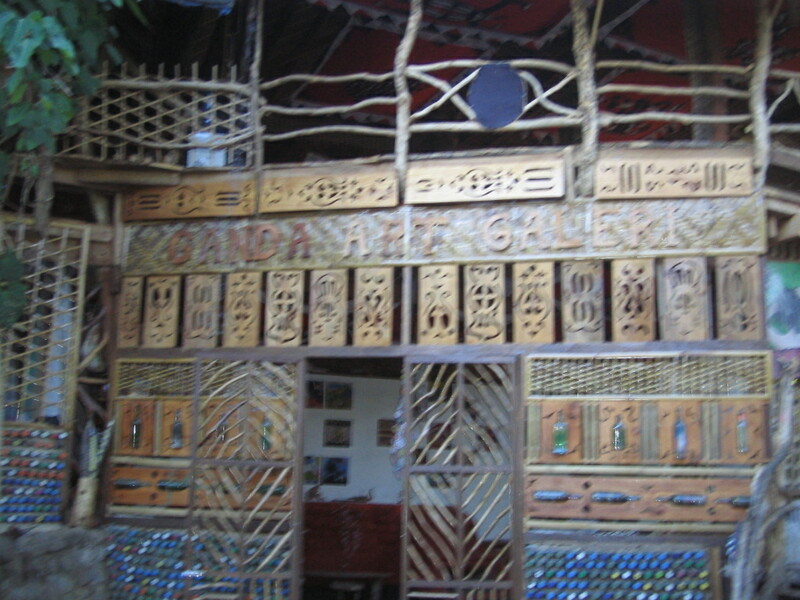 I met two resident artists, Vincent and Venson, who toured me around the area. I commented about the name, and how appropriate Enigmata, from the root word enigma, is to the place. Until I was told that while it was a good coincidence, Enigmata is actually Bisaya for “open your eyes”. Because that is their mission: to open people’s eyes to their various art forms. 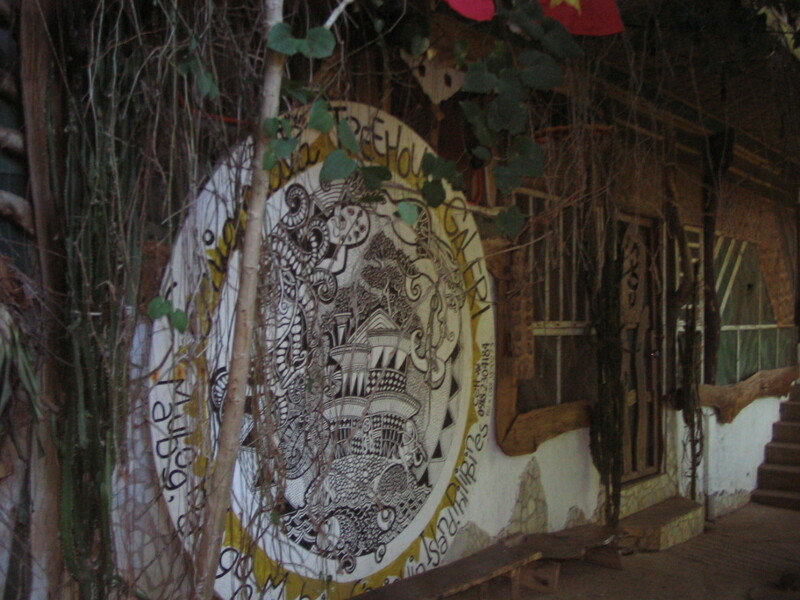 painting, including using sand as the medium, sculpture, installation art, the creation of things like bongoes, beads, etc. Anything creative. 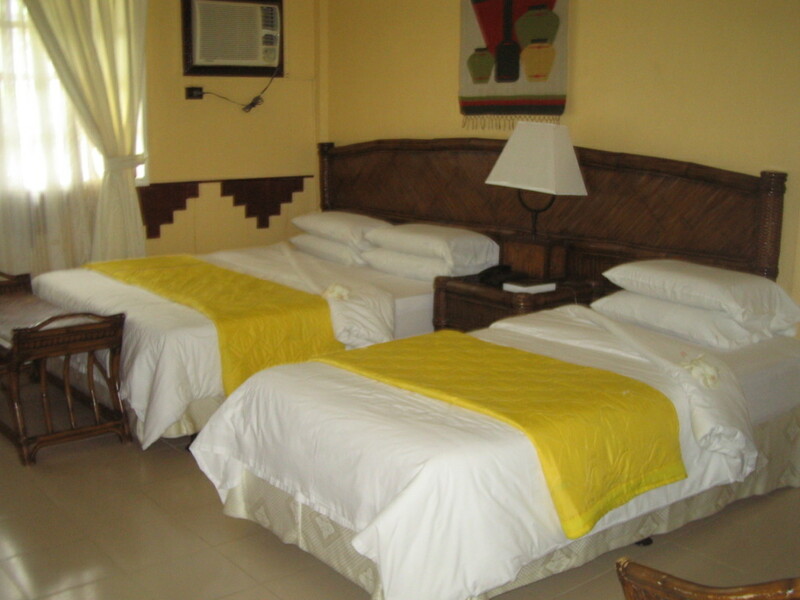 They even have accommodations for backpackers, dormitory-type or private rooms. 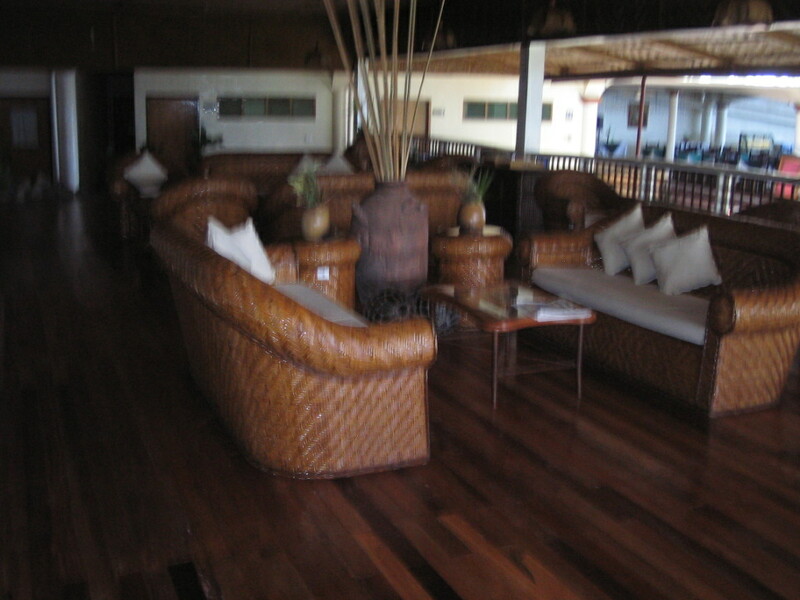 I said I will definitely stay in this place at least one night when I return. 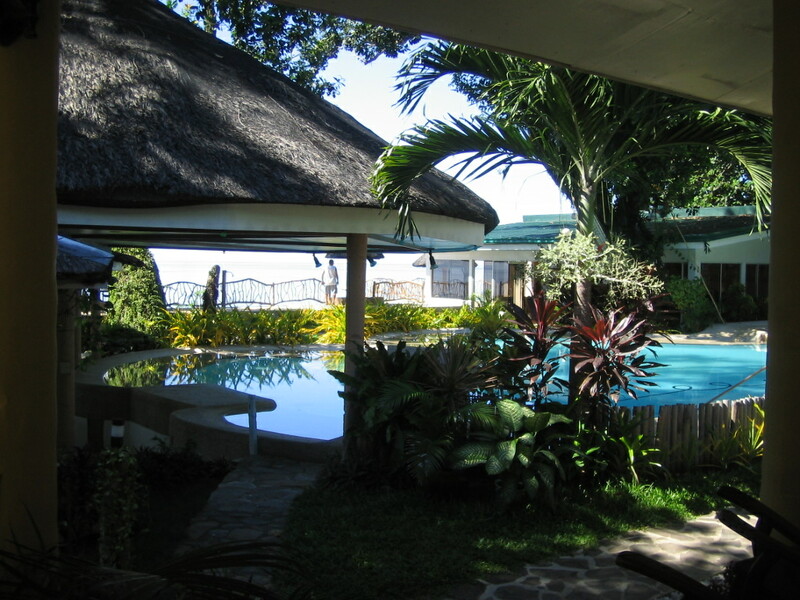 Our last stop for the day was near Bahay Bakasyunan sa Camiguin, the resort I was staying in on the day of the tour. We went to Katibawasan Falls. It is 240 meters long, cascading from the top of a mountain onto a lagoon. 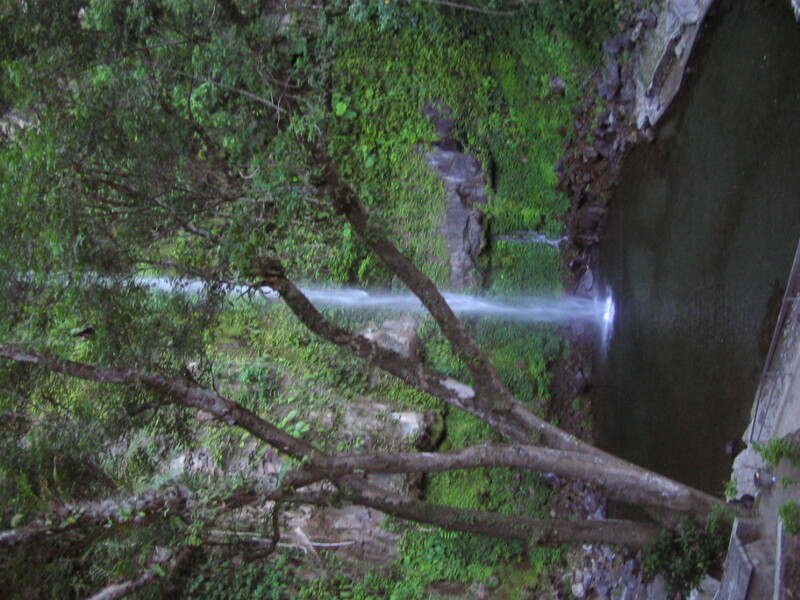 It is a breathtaking sight, with the forest around it lending serenity to the gushing water. Picture perfect. 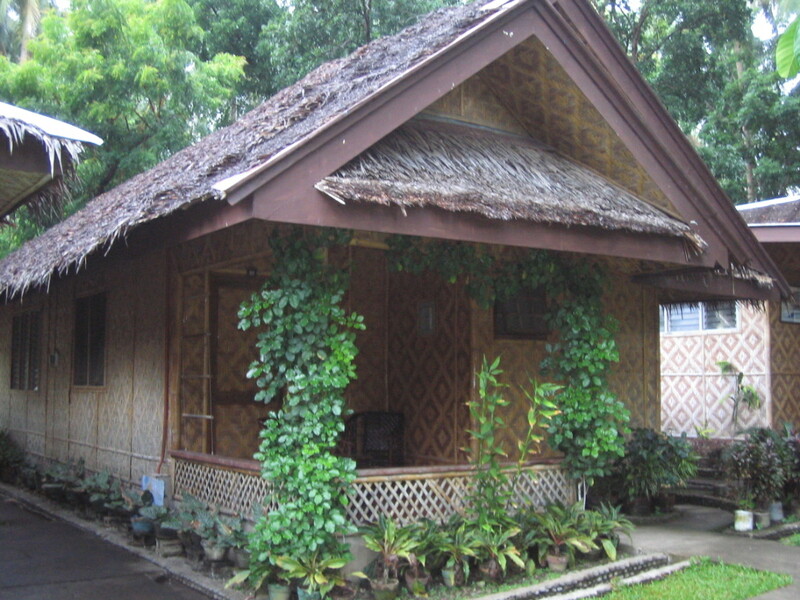 I stayed on the second night at Bahay Bakasyunan sa Camiguin, BBC for short. 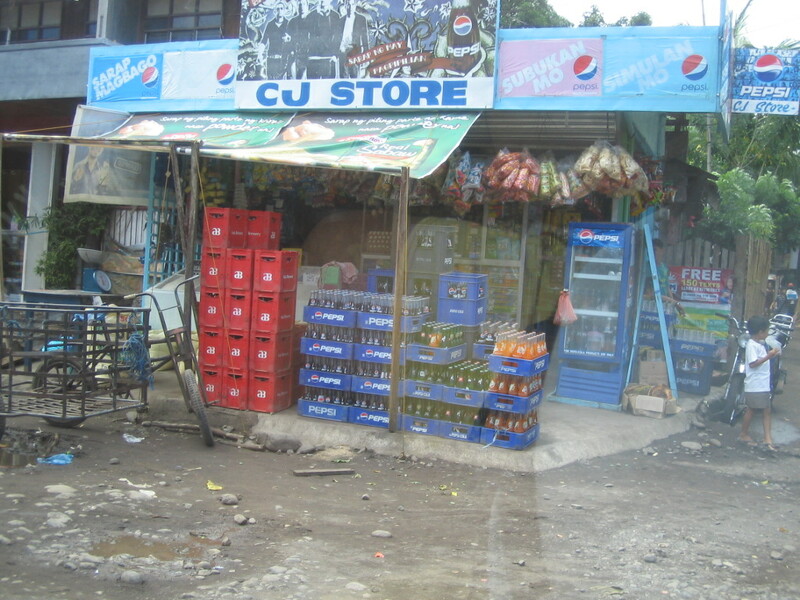 Clearly THE place in Camiguin. Nice de luxe rooms like 5-star hotel rooms for P4,375 per day, with room rates going down to P3,700 as you go farther away from the pool. 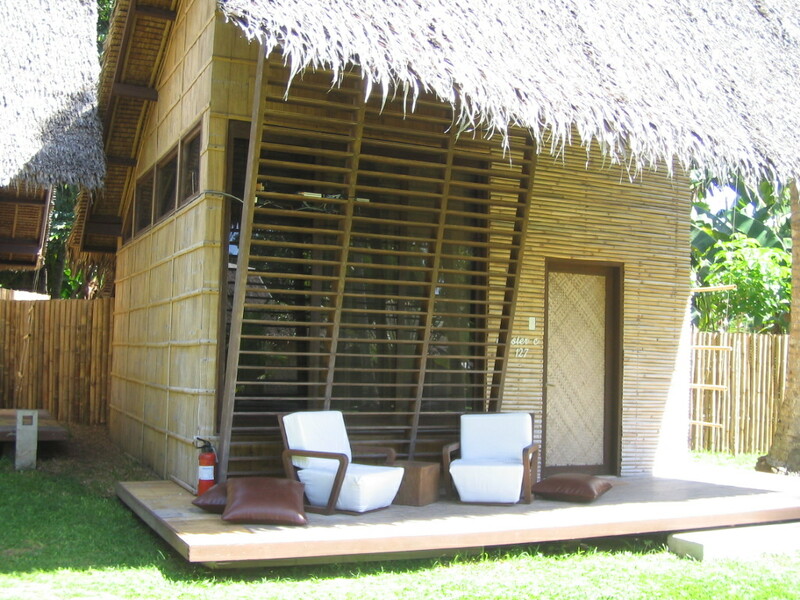 Standard nipa-hut style rooms, air conditioned, go for P2,359 per day. Wi-fi is available. 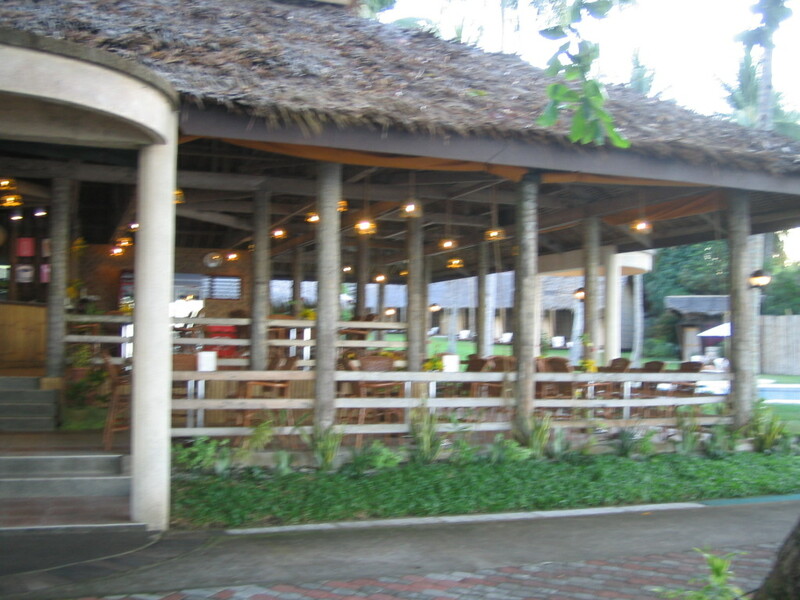 The restaurant and the bar overlook the sea. Lovely place. 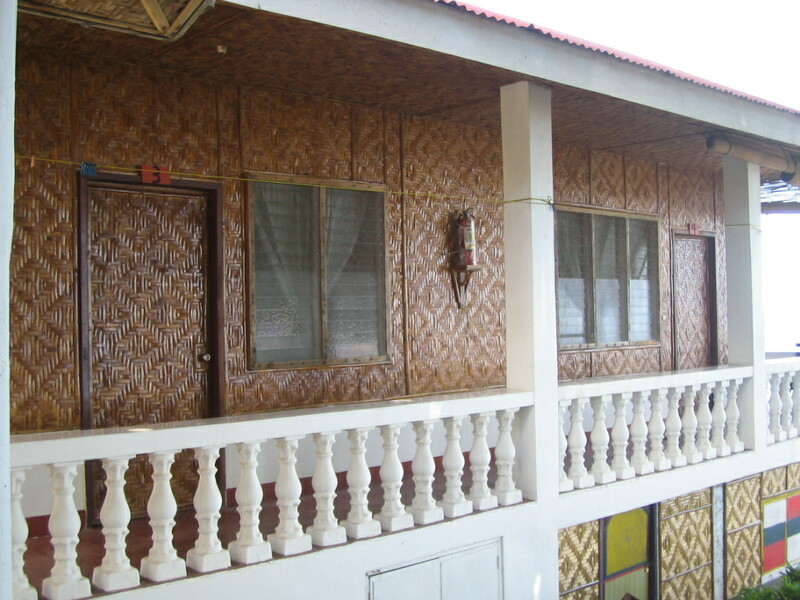 Book them by phone (+6388)3871057 or go to their website http://www.bahaybakasyunan.com. I am definitely staying at BBC on all my next visits, and recommend this and only this resort hotel to friends. Until, of course, a better place comes along. 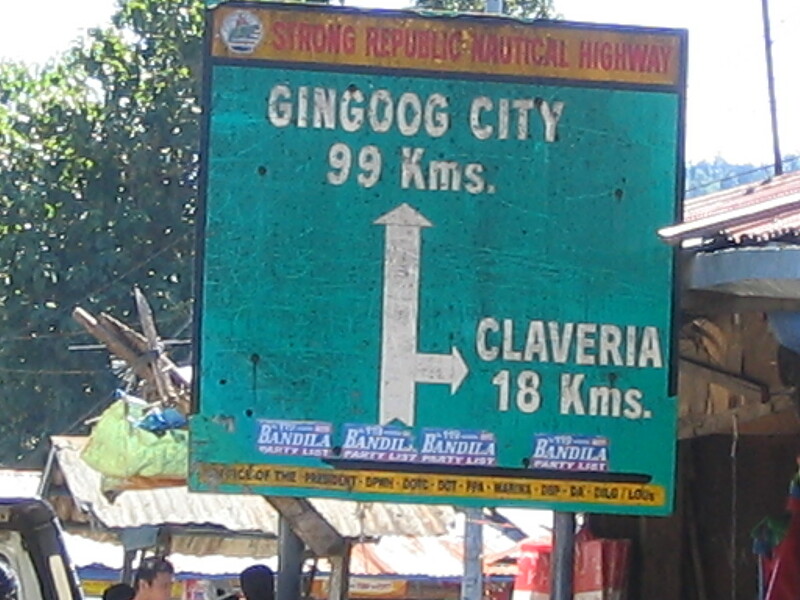 The usual route is via Balingoan, an hour and a half away from Cagayan de Oro. 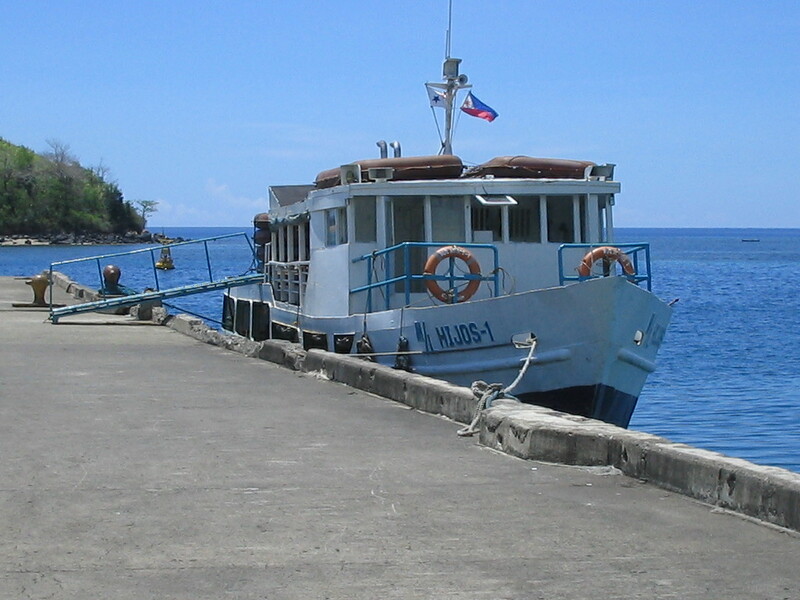 Take a ferry from Balingoan to the port of Benoni in Camiguin. Travel time is 1 hour. 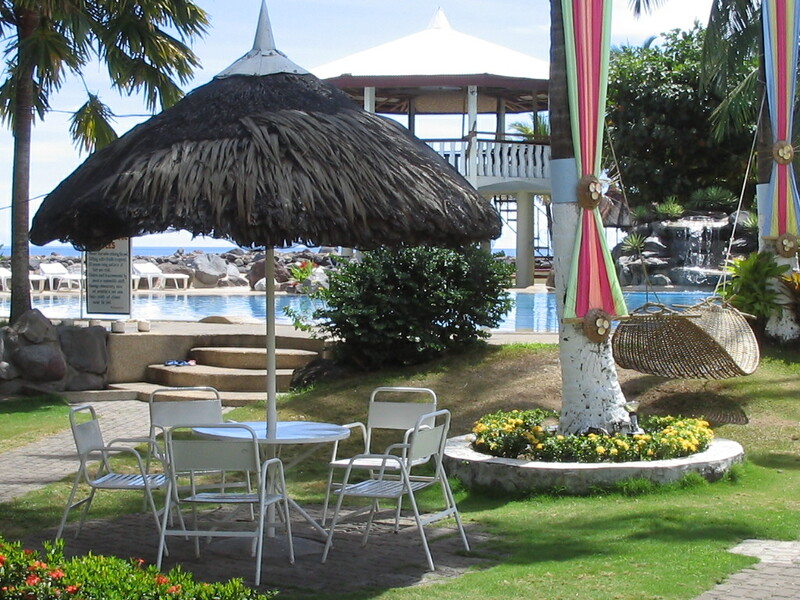 Mambajao, where most of the resorts are, can be reached by motorella, if you have not arranged for pick up with your resort. My pick up cost me P400 on a Multicab. 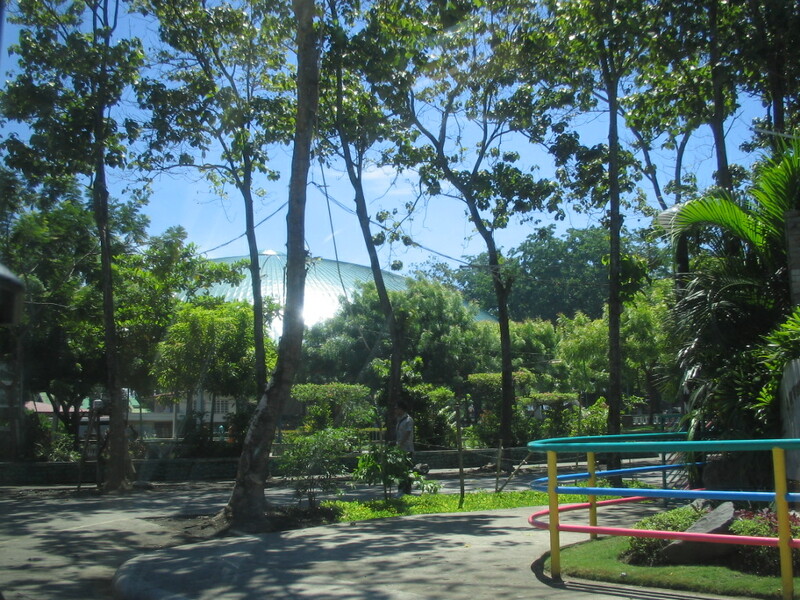 From Cagayan de Oro to Balingoan, you can get into a bus at Agora terminal. 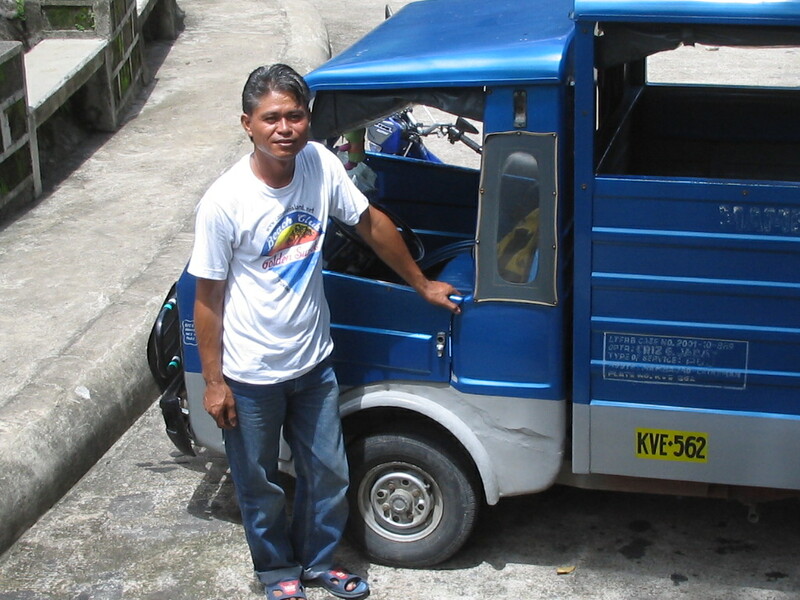 Or take a taxi that will charge a flat fee of P2,000. 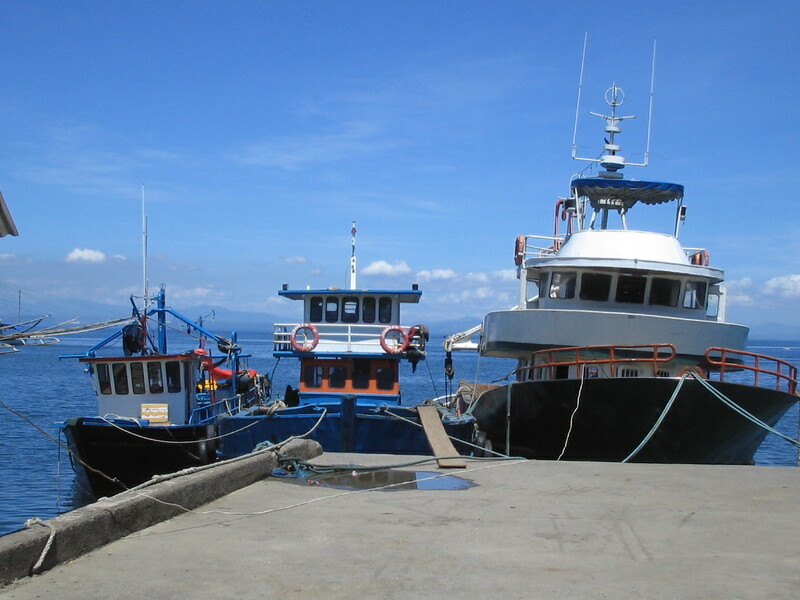 You can make arrangements for pick up, island tour, or boats to nearby islands from the resort. Or even arrange to hire a motorbike. 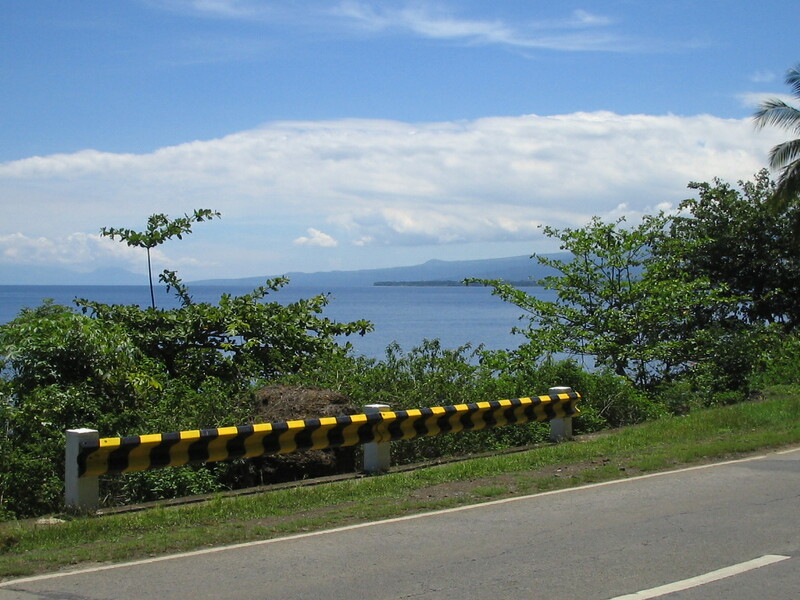 Here are sceneries from Cagayan to Balingoan. 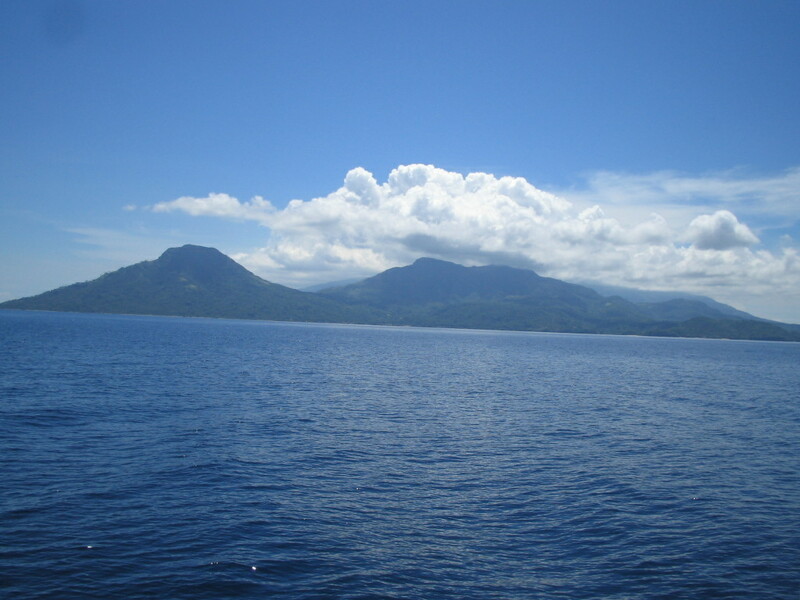 Camiguin is beautiful. It almost tells you “Come again !”. I say, surely.